February 3-- Mrs. Wilma Jean Toole Wilkes, age 78, of the Johnson Corner Community, died Friday, February 1, 2019, in Oxley Park Health and Rehabilitation in Lyons, after an extended illness. She was a native of Toombs County and lived in Johnson Corner most of her life. She was a faithful and charter member of the Edmond Chapel Church of God in Johnson Corner. She was a prayer warrior, and loved God, family and flowers. She was preceded in death by two husbands, Tom Fanning and Pete Wilkes; three infant children, Kurt, Camron and Tonya; parents, Isiah Oliver “Rooster” Toole and Nan Hill Toole; and one sister, Grace Toole Smith. Mrs. Toole is survived by two sons, Chris Fanning and wife Cathy of Indianapolis, Indiana, and Brock Fanning and wife Kimberly of Douglas; eight siblings, Ivy Toole, Sr. and wife Sue, Ann Collins and husband Lawrence, and Wanda Collins, all of Johnson Corner, Connie Beasley and husband Doyle of Cedar Crossing, Jobbie Toole and wife Sabrina of Vidalia, Hilbert Toole and wife Michelle of East Dublin, Herbert Toole and wife Debbie of Vidalia, and Michelle Toole of Vidalia; two grandchildren, Kristanie Fanning and Tyler Fanning; four great-grandchildren, Isiah, Emory, Alexandria and Dax; and numerous nieces and nephews. The funeral service will be held Tuesday, February 5th at 1:00 p.m. in the Edmond Chapel Church of God with Pastor Matthew Floyd officiating. Burial will follow in the church cemetery. The family will receive friends at the church on Tuesday from 11:00 a.m. until just prior to the service. 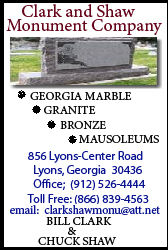 Those desiring may make memorial contributions to the Edmond Chapel Church of God, 2380 Hwy 56 East, Lyons GA 30436.